Since 2001 the UW-Madison Space Science and Engineering Center (SSEC) and the Cooperative Institute for Meteorological Satellite Studies (CIMSS) have hosted more than 20 Remote Sensing Seminars around the world, training aspiring researchers in the field of satellite meteorology and atmospheric science. This week SSEC and CIMSS welcome students from around the United States and Italy to Madison, Wisconsin. CIMSS Interim Director and co-creator of the seminars Paul Menzel leads the week-long course with instruction on remote sensing techniques, guest lectures from leading scientists, and hands-on labs working with real-time data. The Remote Sensing Seminar has been hosted in numerous countries around the world, this year it returns to Madison, Wisconsin and welcomes students from around the United States and Italy. From the left: Donatello Gallucci, Vijit Maithel, Juliet Pilewskie, Paul Menzel, Sean Leavor, Steven Buckner, Monica Bozeman, Stephanie Stevenson, Patrina Bly, and Steven Goodman. 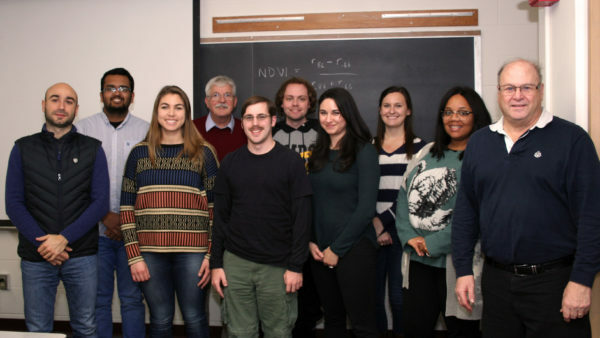 Students get practical experience working with visualization software like HYDRA, and utilizing data from the Community Satellite Processing Package (CSPP) – tools developed at SSEC – to learn how to create composite images and identify environmental signatures. Past courses emphasized the capabilities of Suomi NPP to depict land, ocean, and atmospheric features; this week’s course focuses on the new GOES imaging instrument – the Advanced Baseline Imager. Seminar attendees included researchers and post-docs like Donatello Gallucci from the National Research Council in Potenza, Italy. He participated in the seminar as part of a three-week tour to learn new ideas and improve his understanding of remote sensing techniques to compliment his work with Nowcasting. The Remote Sensing Seminar was originally created by Menzel and former CIMSS scientist Paolo Antonelli (now at the European Organisation for the Exploitation of Meteorological Satellites) to encourage international collaboration and train the next generation of scientists in the fields related to satellite meteorology. Menzel believes international collaboration has always been key to the mission of SSEC and CIMSS, extending back to its roots and founding director Verner Suomi who was a proponent of shared data and international cooperation. To date more than 340 students from 30 countries have attended remote sensing seminars hosted in numerous countries around the world including India, Italy, Kazakhstan, Australia, Turkey, and Poland.